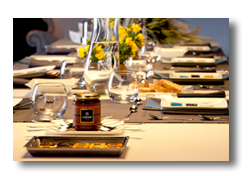 Amedei Gourmet Chocolate and Chocolate Gifts produces in Tuscany. Passion for chocolate, absolute dedication to the work involved and a continuous striving for perfection. These are the qualities that come to life in every taste of the precious Amedei chocolate. Cecilia Tessieri, the first woman to take on the role of maitre chocolatier, made a brave decision starting to produce the best chocolate in the world "from bean to bar", controlling each phase of the production, into an old establishment converted from a cast iron factory: 2500 square meters with the charm of an old world workshop. The resulting product reveals itself as a unique creation, handmade with great care and passion. please send us an email to info@weddingsitaly.it. Cecilia Tessieri has been able to turn her dream into reality, dedicating herself to the art of chocolate, she has also set in place an ecologically sustainable production process, formed a strong brand identity and researched, together with her mother Ida, the design of the confections.The daily philosophy that inspires the team is to attain a product of excellent quality, vigorously respecting the principles of sustainable production and social responsibility. 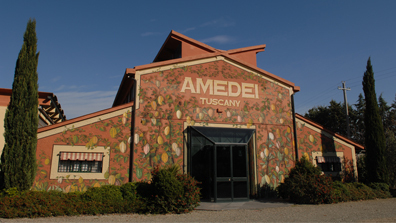 Through Amedei, cocoa has became an instrument of rebirth of territories in which it grows: the Tuscan company is particularly attentive to the improvement in quality of life and to the quality of working conditions of the people that cultivate the cocoa. Amedei’s agronomists visit the villages at various times during the year to ensure that everything is running smoothly, creating a special bond with the campesiños, sustaining their efforts to produce high quality cocoa. In 1990 Cecilia Tessieri decided to dedicate herself to an extraordinary adventure that led her to discover all the precious secrets of chocolate. 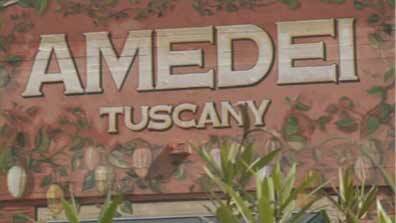 She had the support of the whole family, including her maternal grandmother, a delightful lady, whose surname, Amedei, has been used as the company name. 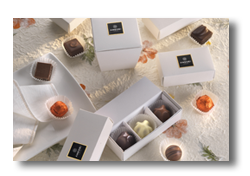 The business started in a small laboratory, 45 square meters and just one employee producing pralines. Perfection was still a long way off: "The chocolate was purchased from others so the product didn't reflect our ideals" records Cecilia. It became clear that the quality of the cocoa and the capacity to process it better were the keys that would guarantee success. Exploring faraway places in search of a unique cocoa - among the plateaus of Madagascar, the impenetrable areas of Venezuela, Jamaica and Ecuador, among the Caribbean Islands of Trinidad and Grenada, in the meantime Cecilia had become maître chocolatier after a long apprenticeship in France, Belgium and Germany. At the same time antique machinery was hunted down throughout Europe, some pieces from the 1800s, others from the period after the first world war. It meant dealing with very delicate machinery, which requires continuous maintenance, where spare parts don’t even exist anymore. So, in 1998, seven years after the initial decision was made to take on this adventure, the first chocolate bars with the brand name Amedei appeared on the market. 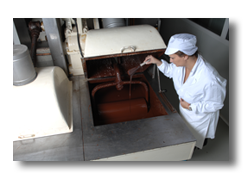 This dedication gave life to a successful and totally innovative venture, maintaining control of the whole production line, from cocoa bean to the finished product. This exceptional quality has resulted in Amedei winning the award for the best chocolate "from bean to bar" many times from the Chocolate Academy of London.